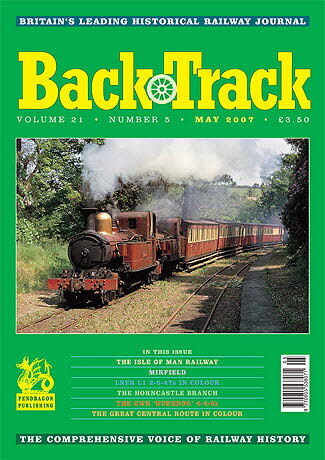 BackTrack May 2007 from Pendragon Publishing publishers of BackTrack, Britain's leading historical railway journal and Railways In Transition series of books. On the Threshold of the Dales - Michael Mensing's colour photos of 1970s diesel traction around Skipton. Logan and Hemingway - Robert Emblin considers the works methods, equipment and administration of these leading railway engineering contractors. Mirfield - Jeffrey Wells looks back at the rise and fall of a West Riding railway centre. Manx August - Geoffrey Skelsey describes the operation of the Isle of Man Railway in 1964. The LNER L1 Tanks - colour feature on these Thompson-designed 2-6-4Ts. Great Central Glimpses - Tommy Tomalin's colour photos of the GC line in its latter years. The Horncastle and Woodhall Junction Railway - a Lincolnshire branch line described by A. J. Ludlam. Twilight of the Dogs - John Reohorn writes about the development and use of the GWR mixed traffic 4-4-0s. Some Reflections on the Narrow Gauge - Part Two of Michael Rutherford's wide-ranging review. Going to see the ships - Publicity handbills for Navy Week 1933 and the launch of the 'Queen Mary' in 1934.